Donning a hefty price tag (£38 a pop) I’ll admit I entered the event sceptical that I’d get my money’s worth. Upon arrival I was greeted by a member of staff who enthusiastically slapped a sticker on my jumper and declared that I was a “Dinosaur”. I trotted into the Museum and gazed with awe at the enormous elevated Dino skeleton. “So I guess that means we’re related,” I silently relayed to the great bones above. At that moment a mock Headmaster told me off for not wearing my uniform, this prodded my inner rebel teenager and she awoke with a grunt and an awkward giggle. What was happening to me? I was a proud Dinosaur just moments earlier. Fortunately there was a bar with wine that I could legally buy without the use of fake ID. This grown-up action successfully shifted me into gear and I was off. After making my Dino head gear so that I felt like a real life reptilian I whipped a torch from a helpful assistant’s hand and into the darkened dinosaur exhibition I went. Stealthily creeping along I successfully managed to scare my boyfriend 1 out 10 attempts all without spilling my wine. Woo hoo! I felt like high-fiving T-Rex Robot but his hands are well creepy and he’s actually pretty scary (I think I’m more of a Diplodocus kind of Dino). So now I’m REALLY in the mood. What next? Live animal show or make your own t-shirt? The live animal show won, although I still look back with a FOMO pain deep inside wishing I had my very own decorated T. The show was, however, fantastic. I mean I stroked the tail of a lizard and learnt that scorpions glow in UV light. Amazing, eh! It was fun, it was interesting and there was a sweetness in that we all sat there like good students listening to the teacher (he was really rather captivating) wearing our hand-made headdresses that ranged from cute pandas to cheeky crabs. 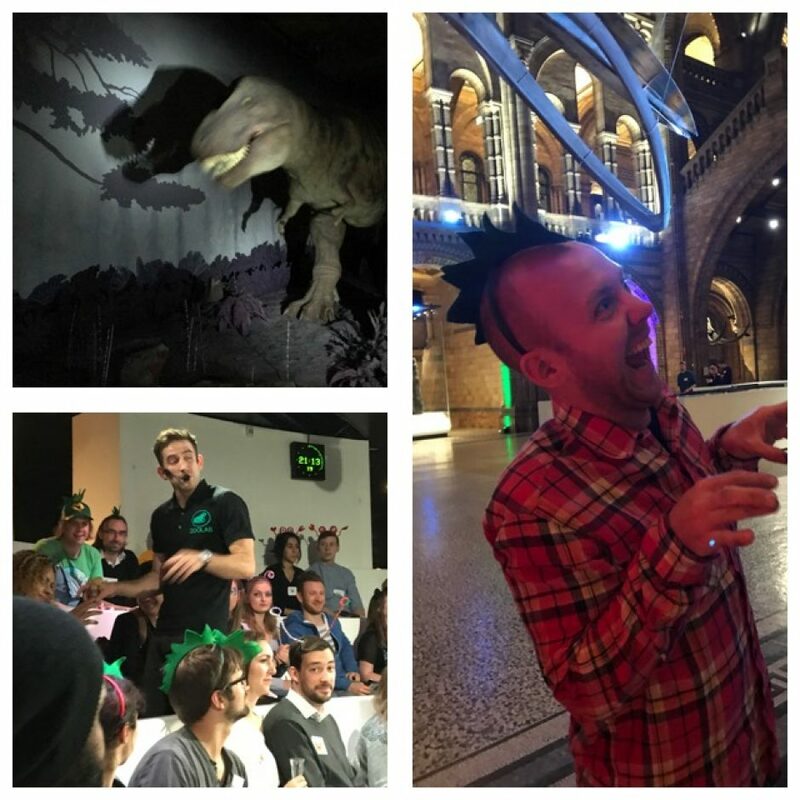 There was a quiz and the Dinosaurs won which made my night. (This was admittedly no secret to anyone in the room). Leaving the show a winner we dashed out the doors and headed to the blow-up Planetarium. I’m not even going to try and describe the beauty of this. Trust me when I say it was a gorgeous and enlightening experience that left me feeling full of wonder. It had nothing to do with the wine, honest! Satisfied and a bit tipsy we were ushered to the silent disco. An attempted shunt past the now-closed glitter station activated my inner rebel once more. I broke free from the line, rubbed my hands in the fallen glitter then proceeded to apply it to any willing recipient. We entered that great hall transformed, we were now Disco Dinos. Presented with three different channels all playing old school music to bring us back to our youthful heyday we danced the night away. What an eclectic mix of revellers decorated the dance floor, all unified by the power of play. We had four hours of ridiculous fun in a spectacular venue. Was it worth? Yes it was! (I mean that with every hip-hop inflected word). Check out www.nhm.ac.uk for more grown-up playtime.